Originating authors are Dirce Uesu Pesco and Humberto José Bortolossi. The images you see on internet pages and the photos you take with your mobile phone are examples of digital images. It is possible to represent this kind of image using matrices. 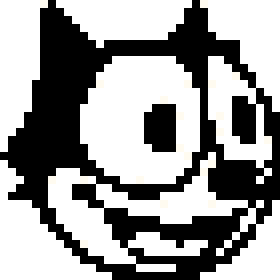 For example, the small image of Felix the Cat (on the left) can be represented by a matrix whose elements are the numbers and . These numbers specify the color of each pixel (a pixel is the smallest graphical element of a matricial image, which can take only one color at a time): the number indicates black, and the number indicates white. Digital images using only two colors are called binary images or boolean images. the image with more details and avoid rounding errors in numerical calculations, as is the case of medical images). Color images, in turn, can be represented by three matrices. Each matrix specifies the amount of red, green and blue that makes up the image. This color system is known as RGB (There are many other color systems that are used depending on the application: CMYK (for printing), Y’IQ (for TV analog transmission in NTSC), etc). The elements of these matrices are integer numbers between and , and they determine the intensity of the pixel with respect to the color of the matrix. 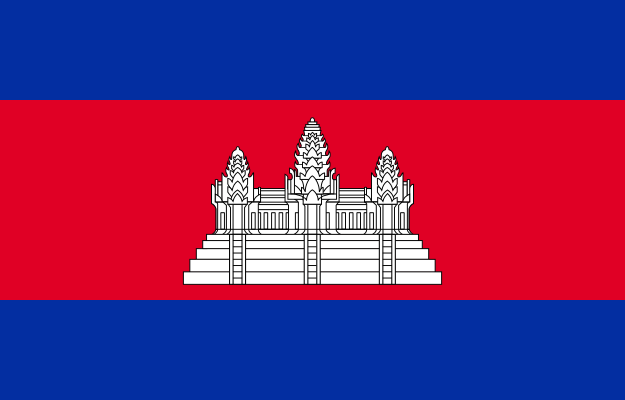 Thus, in the RGB system, it is possible to represent different colors. Once a digital image can be represented by matrices, we may ask how operations on their elements affect the corresponding image. For example, if we consider the binary image below as a matrix, say , then the image corresponds to the transposed matrix of , that is, . The image , by its turn, corresponds to the matrix . Try to discover the matricial relationships between the image and the other images! One more example: using the operations of multiplication by a scalar and sum of matrices, it is possible to create an image transition effect commonly used, for instance, in PowerPoint presentations and slide shows. More precisely, consider two grayscale images of the same size, represented by the matrices and . Notice that , and, for each between and , the elements of the matrix are between the elements of the matrices and . Therefore, when varies from to , the matrix varies from to . For the case of color images, the transformation above must be applied to the matrices , and that compose each image. Why is that? Suppose that , a grayscale image of size , must be transmitted from a satellite to a laboratory on Earth. In principle, the satellite would have to send million numbers (one for each pixel). As typically only the first elements of the matrix of the SVD decomposition for are significant (the others are “small”), it is enough, then, that the satellite sends, say, the first columns of and , and the first numbers (totaling only numbers that must be sent). Upon receiving these data, the laboratory on Earth calculates the matrix that will give an approximation of the original image. 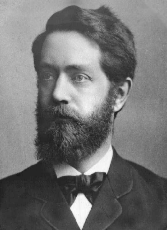 Let’s see an example: the picture below of the mathematician Christian Felix Klein (1849-1925) has pixels. From the SVD decomposition of the corresponding matrix of this image, we can calculate the matrices for and . These matrices generate approximations to the original image, as illustrated in the following figures. Notice that the original image corresponds to the case . It is quite impressive, is it not? Digital image processing has many applications, such as remote sensing, data transmission, medicine, robotics, computer vision, film industry, etc. In remote sensing, for example, images acquired by satellites are useful for tracking natural resources, geographical mapping, analysis of urban growth, and many other environmental applications. In the transmission of images, we have communications via fax, networks, the internet, and closed-circuit TV for monitoring and security. In medical applications, we have X-ray image processing, projection images of transaxial tomography, radiology, nuclear magnetic resonance (NMR) and ultrasonic scanning. Some methods of acquisition and transmission can generate noise in an image. The median filter is an image processing technique used to remove them or reduce their effects: for each element of the matrix that represents the image, we observe its neighboring elements and, then, we arrange them in an ordered list. The median filter consists of choosing the central element of this list and replace the element at the center by this one. There are many other techniques in image processing with different objectives. The following images illustrate examples of contrast adjustment, edge detection and threshold. Our objective with this text is to present a little known application of matrices for teachers and high school students: the processing of digital images. It is important to notice that the mathematical tools related to this topic go far beyond matrices. The subject is vast, rich and modern. Unfortunately, the limit of few pages recommended for this article does not allow us to provide further details. As a starting point for the reader motivated to find out more, we recommend the books [Gonzalez and Woods, 2007] and [Gomes and Velho, 2008]. On this website (or at its mirror), there is a series of interactive applets that allows you to explore the relations between matrices and digital images presented in this text. You will also find a DOC file with suggestions of exercises to be worked in the classroom. Gomes, J.; Velho, L. Image Processing for Computer Graphics and Vision. Springer-Verlag, 2008. Gonzalez, R. C.; Woods, R. E. Digital Image Processing. Third Edition. Prentice Hall, 2007. Lay, D. Linear Algebra and Its Applications. Forth Edition. Addison Wesley, 2011. Poole, D. Linear Algebra: A Modern Introduction. Second Edition. Brooks Cole, 2005. The photo of the Mona Liza in LEGO is a property of Marco Pece Udronotto, who kindly granted permission to use it in this work. Excellent, I really enjoyed this article. I wonder if it’s not too far out of the way to introduce the SVD via eigenvalues and diagonalizing a matrix, which I believe *is* often covered in linear algebra classes. Also, I personally am wondering what connection there is between the SVD filter approach and filtering using Fourier analysis. Eigenvalues and diagonalizing matrices are indeed covered in undergraduate linear algebra courses. However, this article is not designed to introduce linear, but to provide an interesting example of it, in digital images. As far as I know, there is no connection between SVD decomposition and Fourier analysis, which is used in other image compression algorithms (like JPEG for example). Hi! If I am not mistaken, The Klein Project is aimed to senior secondary school curriculum. In Brazil, Linear Algebra and Calculus are not presented in secondary schools. They are studied only in College! Indeed, one of the reviewers of the Portuguese version of this vignette suggested to cut off all SVD stuff because he found the subject too advanced for brazilian secondary school teachers. So, we have decided to keep the presentation as simple as possible. In case of color image, which matrix do we use as ‘A’ in the above? I mean color image having RGB values then we will get R, G, B matrices. how to perform SVD on these matrices. In case of a color image, just apply SVD to each of R, G and B. We do not have a java code for this, but you have all the informations you need to create one. However, there are codes available on the internet for more efficients image compression algorithms. I am working on a series of 20 minutes powerpoint presentations of math news snapshots for high school students, to be interwoven in the ordinary curriculum. Would you be interested in joining it by working on such a snapshot following this vignette? Sure! Could you, please, give further directions? This is a wonderful post, and I’d love to use it with my students, but Java security issues prevent me from accessing any of the interactive code on the supplementary sites. That’s very disappointing, but otherwise, this is great! 1.How to represent the image in various possible spaces like time domain , frequency Domain, Using Fourier Series etc. 2.What is Image preprocessing and what are the different techniques for image preprocessing. I am a University Student and i am researching in Image Processing field. I would be glad if you reply me.